The works of Joan Miró, one of Barcelona's most famous 20th-century artists, are displayed in this museum in Parc de Montjuïc. The gallery itself is a piece of modern art, its design incorporating terraces and interior courtyards to direct the flow of visitors and give the space an open air feel. It shouldn’t be missed. This Barcelona museum is home to a collection of more than 14,000 pieces by Miró—one of the most comprehensive collections of his art in the world covering several mediums and all stages of the artist’s career. Spend more time enjoying the collection and less time queuing up with a skip-the-line entrance ticket, or opt for the Barcelona Museum Pass for entrance into six of Barcelona’s most popular museums, including the Picasso Museum and the National Art Museum of Catalonia. Entrance to the Miró Museum is also included on the Barcelona Card and the complex is a stop on a hop-on hop-off sightseeing bus tour. 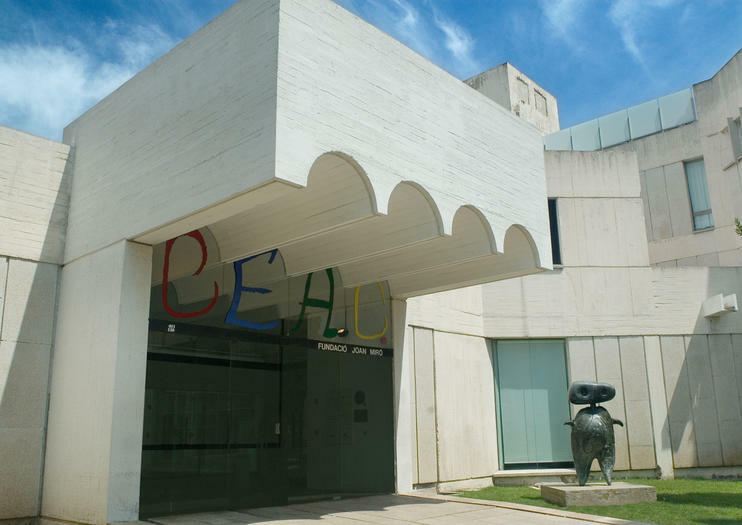 The Joan Miró Museum is a must-visit for art lovers and architecture buffs. Free Wi-Fi is available to visitors throughout the museum. The museum is wheelchair accessible, as is public transportation to and from the museum site. The Joan Miró Museum is well connected by public transportation. Take bus 55 or 150 to Parc de Montjuïc or ride the Montjuïc Funicular from the Parallel metro station. There is no parking available at the museum. The museum is open from Tuesday to Sunday and is closed on Mondays and public holidays. There are free guided tours of the collection in English each Thursday afternoon. To further promote his belief that art should not be categorized or restricted, Miró dedicated his pieces to the Fundació to be displayed only under the condition that a space be reserved to exhibit the works of emerging artists. In keeping their word, the Fundació created Espai 13, which holds exhibits of upcoming contemporary artists.